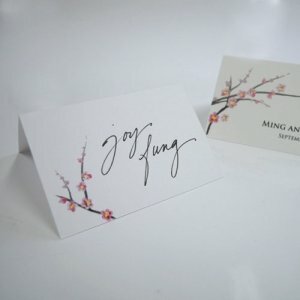 Shipped as flat personalized cardstock, these scored cards can be easily folded to achieve a standard size 3 inch by 2 inch self-standing tented place cards. Since they arrive flat, you could run them through a laser printer to print the guest names if you prefer that to handwriting each one. Flat cards are sold in sets of 6 with a four set minimum order requirement. NOTE - these place cards are part of our cherry blossom stationery collection so you can combine them with other items for a fully cohesive look. Product dimensions: 3 inches x 4 inches (unfolded). Sample Orders - If you would like to order a sample of this stationery collection, search for item X1024-19. You will receive a sample invitation along with a list of items and colors available with this design.